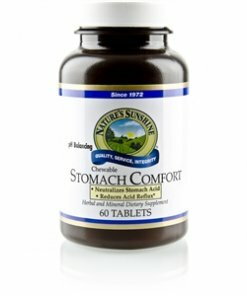 Nature’s Sunshine Stomach Comfort alleviates occasional stomach discomfort with a blend of nutrients that includes calcium carbonate, alginic acid (from kelp), wintergreen oil, papaya fruit, slippery elm bark, licorice root concentrate, and ginger rhizome. 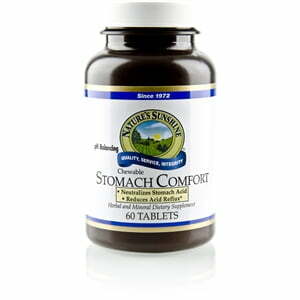 Stomach Comfort calms the digestive system and supports healthy digestive function. It may assist in alleviating occasional acid reflux or gas. Instructions: Chew one or two tablets up to three times daily for quick, temporary stomach relief. Remember that digestive problems may be a sign of more serious health concerns. For pH balancing, chew 1-2 tablets between meals. Xylitol, caseinate powder - milk derived (calcium, sodium, lecithin), fructose, stearic acid (vegetable), magnesium stearate (vegetable), and natural flavors.